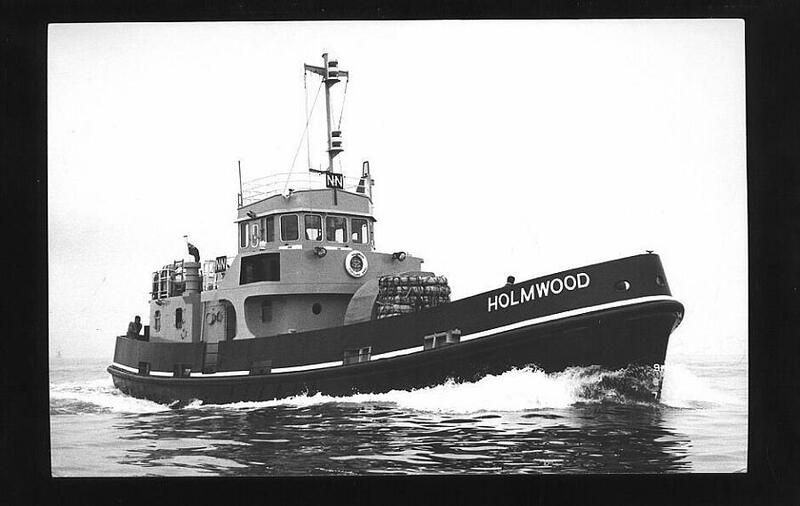 Holmwood was built in 1973 as an RMAS Fleet tender and served at Portland for over twenty years, acting as a ferry for the transfer of personnel to and from Navy vessels. During all her time at Portland, she had the same Bosun, Ken Wilks of Weymouth, who treated Holmwood as if she was his own. In the ship's paperwork, there are constant references to Mr. Wilks and his crew for the way they looked after the ship. It was to be this care that was the key to her survival. Operation of Fleet tenders passed to a private company and Holmwood was transferred to Plymouth for a new but short life, with her advancing years and cutbacks in maintenance budgets, she soon became troublesome and after developing a number of faults which made her difficult to operate, finally, in 1997, she was laid up. To make matters worse the ship was then robbed of parts to keep other Fleet tenders running. She then suffered the final indignity of being towed to Portland and put on the disposal list. During winter of 2002-3, local skipper Grahame Knott, was looking for a new challenge! And there it was! Partially flooded, bits missing all over the place, every electrical system dead, the main engine and generator partially dismantled, all on top of five years of neglect. It seemed at first glance an impossible task but underneath all the dirt and decay there was still a sound ship, thanks to her years with Ken Wilks and his crew. 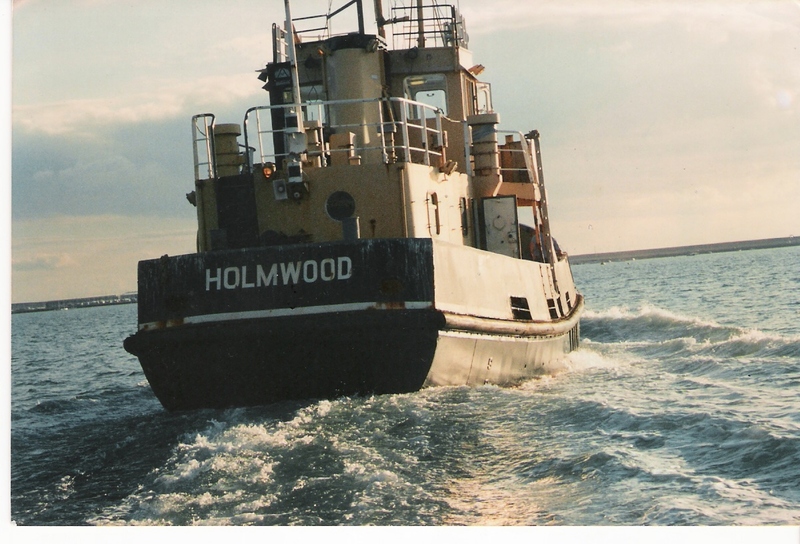 It has took six months of hard work to get Holmwood back into operation, she went to Plymouth for a survey and this time came back to Portland under her own power; Grahame was sure he heard a little mechanical cheer as she came through the harbour entrance! although in need of a serious paint job Holmwood is capable of going anywhere under her own power. 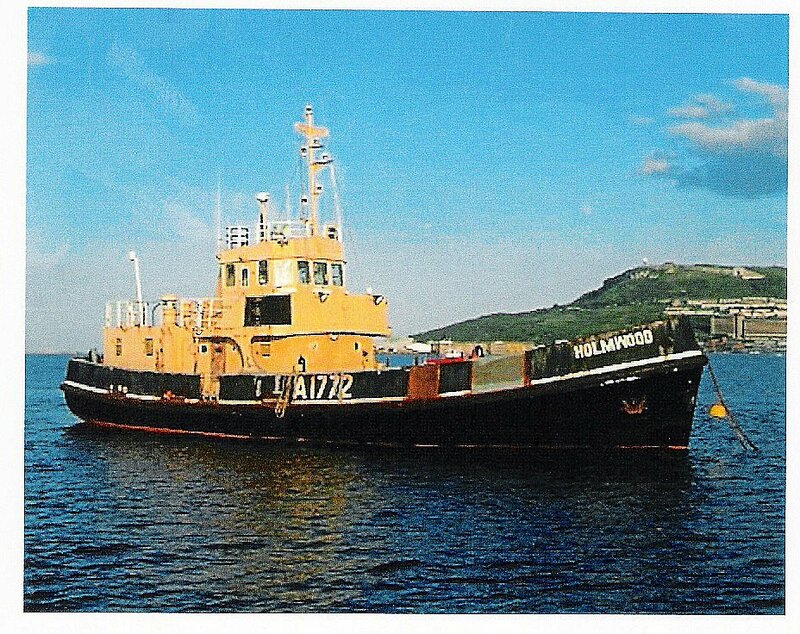 Shortly after this Grahame became ill with a back injury, he struggled on for a while trying to continue with Holmwoods refit, he eventually decided he would have to sell Holmwood, at this time Peter Hall was looking for a new challenge after completing many years as a single handed sailor and delivery Captain of yachts and ships. Operation of Fleet tenders passed to a private company and Holmwood was transferred to Plymouth for a new but short life, with her advancing years and cutbacks in maintenance budgets, she soon became troublesome and after developing a number of faults which made her difficult to operate, finally, in 1997, she was laid up.